The BJP which romped to power in Himachal Pradesh by trouncing the Congress saw a jump of about 10 per cent in its vote share as compared to the the last Assembly polls in the state in 2012. NEW DELHI: The BJP which romped to power in Himachal Pradesh by trouncing the Congress saw a jump of about 10 per cent in its vote share as compared to the the last Assembly polls in the state in 2012. On the other hand, the Congress despite polling just one per cent votes less than what it got in 2012, was sent out of power this time. 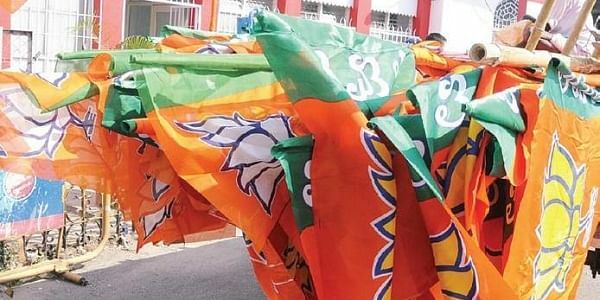 The BJP bagged 48.8 per cent of the total votes, securing 18,46,432 votes to return to power after winning 44 seats, against the 38.47 per cent votes it had polled in 2012 when it won only 26 seats by polling 13,00,756 votes in its favour. The Congress won 21 seats in the 68-member Assembly after polling 15,77,450 votes, which is 41.7 per cent of total votes cast this time. The Congress had in 2012 polled 14,47,319 votes, which was 42.81 per cent of total votes cast, to secure power from the BJP in the last Assembly polls. Meanwhile, many other top leaders in the state lost their seats by very narrow margins this time around. BJP's chief ministerial face for the Himachal Pradesh polls, Prem Kumar Dhumal, was defeated from the Sujanpur Assembly seat. The former chief minister lost to his Congress rival Rajinder Singh Rana by 1,919 votes, according to the Election Commission. Dhumal got 23,369 votes against 25,288 votes polled by Rana. Baldev Sharma of BJP lost to Congress' Inder Dutt Lakhanpal from Barsar assembly seat by a margin of only 439 votes, while Congress secretary in-charge of Punjab Asha Kumari won her Dalhousie seat from D S Thakur of BJP by merely 556 votes. In Kasauli, Rajiv Saizal of BJP won the seat by a margin of only 442 votes against Vinod Sultanpuri of the Congress. He won the seat from Sultanpuri last time in 2012 by a narrower margin of only 24 votes. Jagat Singh Negi won the Kinnaur seat against BJP's Tejwant Singh Negi by a margin of only 120 votes. Himachal Congress' Cabinet Minister G S Bali lost his Nagrota seat to Arun Kumar of BJP by a narrow margin of only 1,000 votes. Dhani Ram Shandil won the Solan seat from BJP's Rajesh Kashyap by a slender margin of only 671 votes. Taking a dig at the BJP, Congress communications in- charge Randeep Surjewala said, "It is not clear whether the BJP Parliamentary Board under a conspiracy defeated him by sending him to Sujanpur so that a person of choice could be imposed in the state." "It is not a good sign at least in the 'Dev bhoomi' of Himachal Pradesh," the Congress leader said. "While Modi praised himself, he rejected the leadership of Vijay Rupani and Prem Kumar Dhumal. What cooperative federalism?" he alleged.